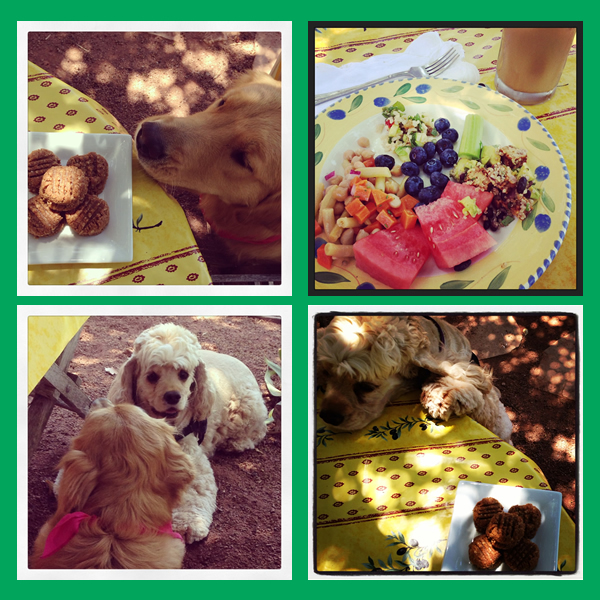 It’s the Dog Days of Summer, and we’re celebrating with a blog hop. Scroll to the bottom to read posts from other bloggers who are helping support my Kickstarter campaign. 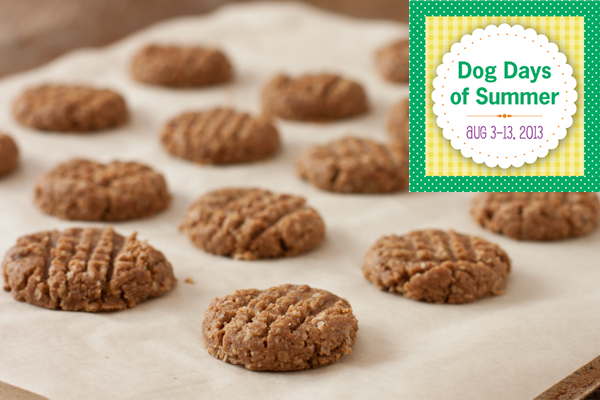 And because we’ve been attending doggy picnics for the last two weeks, I made a special dog biscuit recipe that’s super-easy with only three ingredients! You can make this with peanut butter, almond butter, or sunflower seed butter. Please read the notes below, as these special treats are high in fat. 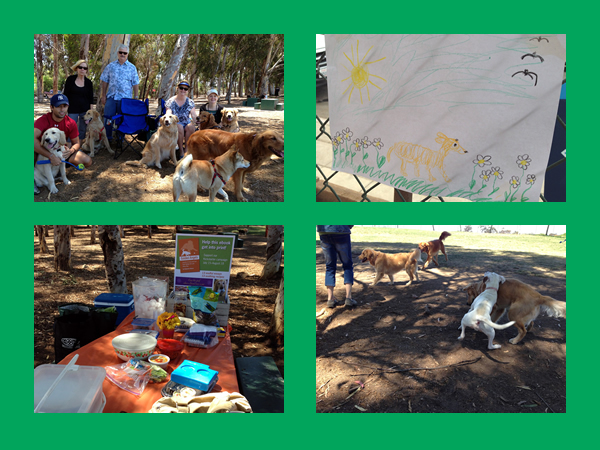 We hosted a picnic for other Golden retriever owners at our local dog park: We had a few food bloggers over for a picnic. Daisy’s friend Starbuck came too. Put the flax seeds in a small bowl with 4 T. (60 ml) filtered water. Add the oats to the food processor and process until a chunky flour. Add the nut butter, flax seed gel, and 2 T. (30 ml) of water. Blend until the dough becomes a ball. If necessary, add a little more water. Use a tablespoon to measure out the biscuits, then flatten with a fork in a criss-cross pattern if you like. Bake 10-15 minutes until golden brown. Cool completely. If your dog will not eat them within a week, store them in the freezer. Notes: We found that treats with peanut butter used to make Buddy Girl’s ear infections worse, so we switched to sunflower seed butter. However, the Trader Joe’s brand does include sugar, so I simply used almond butter for this recipe. Daisy loves them! Because they are a calorie-dense treat they are not for every day. I would give her no more than one of these per week. According to my vet, Dr. Candy Lewis: “Both peanut butter and almond butter are very high in fat which can lead to pancreatitis in certain dogs. Almonds are not toxic, although should be avoided for dogs with a tendency to have pancreatitis.” If you’re looking for a low-fat treat, try my juicer pulp doggy biscuits. These look easy and like something my pooch would love! Thank you for the recipe. I am concerned about substituting almond butter as I’d read that almonds can be toxic to dogs. Your thoughts, if any? Thank you. Hi Tricia, I have sent your question in to my vet. As far as I can see with the research available online, almonds are not toxic to dogs, but their high fat content (just like other high-fat foods) can cause stomach upset. Macadamia nuts, on the other hand, are actually toxic to dogs. I will let you know if my vet says otherwise. In any case, these “cookies” should only be given sparingly, as they are high in fat and calorie dense. I would give Daisy one of these per week. Does that help? Let me know how The Girls like them Ricki. Daisy whines for them if they are within smelling distance. Yes, they are very tasty! I love that they are just 3 ingredients too.